When the end of January arrives, we often look back at the resolutions we made a mere month ago, and have since given up. So how about setting a few productivity habits that are easy to stick to? In this post, I'm sharing five productivity booster changes you can make to the way you use Alfred. Each one should only take you a couple of minutes to set up, and could save you far more time over the year. Think of documentation, wikis or any other site you search frequently. Could you speed up this research by creating a custom search for it? With a custom search, you can type the keyword for the site followed by your search term, and press Return to launch the results page. 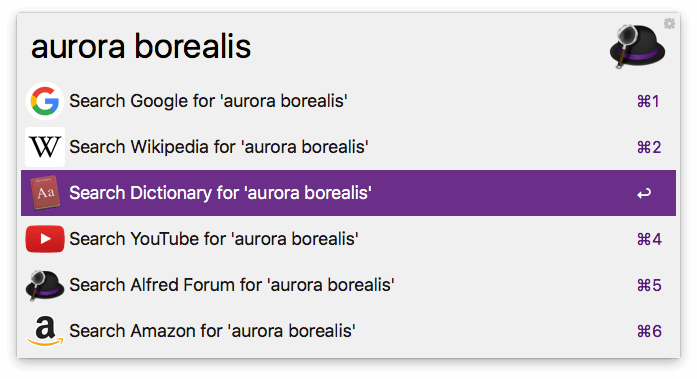 Take a look at our Guide for creating your own custom searches or pop by Alfred's preferences under Features > Web Search to get started. Share your custom searches with colleagues and friends to save them time too! Take a good look at the phrases, links or email responses you use a lot. How much time would you save by creating auto-expanding snippets for these? It's not just the time it takes to type out the text,it's also the mental energy expended thinking about your response, finding the right link and re-reading yourself to ensure you've answered correctly. Pop by Alfred's Features > Snippets preferences and check "Automatically expand snippets by keyword" in the top right to get started. If you're new to text expansion, we've created a detailed help page on Snippets to guide you along. Top tip: If you use Alfred's Clipboard History feature, you can select a text clip in the Clipboard Viewer and press Cmd + S to quickly save it as a snippet! We accumulate vast amounts of data on our Macs, in more or less organised ways. 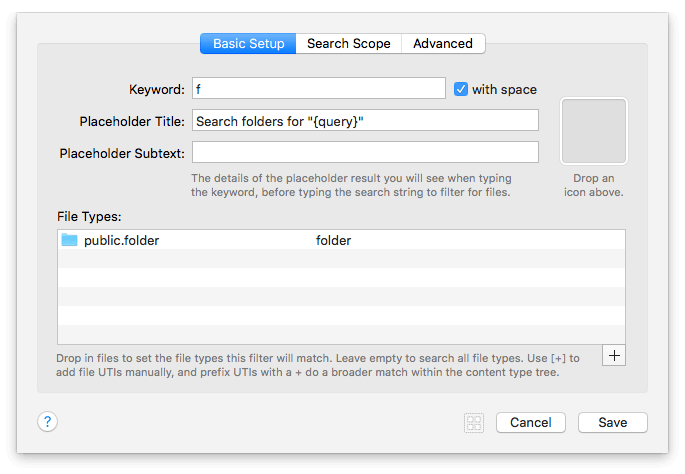 With a File Filter workflow, you can tell Alfred where to search, and which file types to include in your search. For example, you can create a file filter specifically for folders in your main "Work" folder, without the results being cluttered by non-work items. Equally, you could create a filtered search for your Photoshop files only, saving you from fishing around various folders to find where you put those evasive client files! Learn how to create your own File Filter Workflows or choose the "Simple Folder Search" example from the wide range of workflows built into Alfred. Fallback searches are the list of search options you see when you search for a keyword that doesn't match a result on your local Mac. By default, these are Google, Wikipedia and Amazon, as these are the most commonly used web searches. With the Powerpack, you can customise these to be your most commonly used web searches or workflows. Find out more about creating your own fallback searches or set them up in Features > Default Results, under "Setup fallback results". If you'd like Alfred to remember the last queries you typed, you can enable this in Alfred's Advanced preferences under "Store Typed Query History". You can also choose to show the latest one if you pop up Alfred within 5 minutes of your last query. If you're already an Alfred pro, why not introduce a colleague to Alfred or one of the features you love most? After all, the more productive your team is, the more you will be too!